and sell with visual story-telling videos. Animiz whiteboard animation software for mac is free download on animiz.com. You are sure to create your own outstanding, high-definition, whiteboard-style videos with easy-to-use interface. No design or programming skills needed, you just open your software on mac, then creating, editing, publishing and sharing progresses are just a mouse of click. Amazingly, there are multimedia contents offered for you to deliver huge value. This tool will act professionally, connecting you and audiences closely through unique video design. Stunning animation viewing experience brings great results. Animated drawing hand effect is playing an important role to give artist drawing stories. Among 300+ animations, this tool inspires you to wow audiences with real drawing whiteboard animations. After adding elements (images, text, videos, characters, SVGs, shapes, etc) in canvas, you then make them animated with eye-catching entrance animations: Hand-drawn. Gorgeous hand-drawn animation effects will certainly bring your contents to life. Of course, you can choose an animation color that is similar to your elements, and select a hand draw effect from 4 presenting styles. Then you are able to adjust hand-drawn's duration at the timeline so that your contents be presented charmingly. Voice-over narration is proven as a great storytelling power to spread contents. You will arouse your target audiences' interest by clicking Recording button and add your voice in video animations. You can cut the recording where you need to make a narration of important points, or you can add vivid recordings during the whole videos. Customizing its volume to make your sound loud, Apply to All Sound as needed. As a result, your contents will be easily accepted and understandable with natural, relative and to the point narrative sounds. Like a great amount of whiteboard animations, dynamic characters added can quickly capture audiences' attention. Animiz animation software for mac provides rich characters for you to animate your whole contents. You can wisely use a variety of roles from different industries in videos, or add your customized ones to create memorable whiteboard animations. From body, motion and emotion, you could make every role presented outstandingly. Moreover, freely fixed its position when added zooming cameras, then these characters will not change positions and act professionally in videos. Click to freely download Animiz whiteboard animation software for mac, start and create stunning videos. Add eye-catching Hand-drawn animations for elements. Bring contents to life with drawing visuals. Arouse target audiences' interest by clicking Recording button and add your voice in videos. Wisely use a variety of roles from different industries, or add your customized ones to present contents. 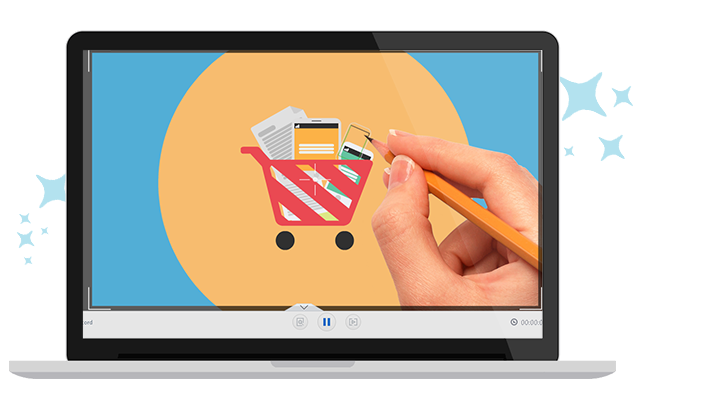 Publish whiteboard-style animated videos in 6 different formats offline, then share with audiences.